On September 29th and 30th, in Via Baltea 3 in Turin, were held two days of presentations, meetings and shows reserved for the staff and the collaborators of SCT Centre. A moment to talk about newly completed and ongoing projects, to update on the methodological approach of the Social and Community Theatre and to exchange, as gifts, some pills of given performances. The first day opened with the description of the Centre and the projects made during the last year by the director of the Cent, Alessandra Rossi Ghiglione. Alberto Pagliarino – the SCT project manager responsible for the “plural communities” area and Caravan Next and Terract project project manager – and Antonella Enrietto, actress and playwright, presented the TSC project in Canton Ticino with the OTAF Foundation, Albergo della luce. They played out an excerpt of the show realized from the interviews with the OTAF Foundation’s staff, families and disabled children resident at the OTAF. When the readings were completed, Maurizio Bertolini, head of the “Theatre in Emergency Context” area, illustrated the differences between the intervention in emergency contexts and in cooperation contexts, more stable, and introduced the operators Francesca Longo and Manuela Pietraforte, engaged in TSC intervention in South Sudan in collaboration with IOM. Francesca presented some “postcards” from South Sudan, some evocative images of the life of operators in the Bentiu refugee camp, where the project took place, while Manuela explained what it means to bring social theatre in an emergency context such as South Sudan, a country in war: accidents may happen, the work has to stop because of internal conflicts the refugee camp, the lack of security and the habit of living without comforts. At sunset, the photographer Maurizio Agostinetto made a brief speech on the aesthetics of photography, starting from personal documents and personal projects. By the end of the first day, Alberto Pagliarino hold a brief dissertation on Copeau and the birth of the social theatre with communities. During the evening of the first day, three actors working with the Centre gave us a taste of their shows: Antonella Delli Gatti represented The Horse-Sea, the story of Peppino Impacted through the words of Felicia Bartolotta, his mother, a woman who refused the rule of silence and the acceptance of violence. Finally, Paola Galassi and Marco Cinnirella, SCT operators in Crotone for the project “I do not travel alone” of SOS Children’s Villages, brought in the show Storie Migranti born from the laboratories with the Unaccompanied Foreign Minors and represented on the seafront of Crotone. The second day opened with the intervention of Lorena La Rocca, Operator of Social and Community Theatre, on the relationship between this methodology and social policies and the opportunity to use the theatre as a sociological research instrument designed to propose solutions to emerging social problems. So, the operators Paola Galassi and Manuela Pietraforte, involved in the project The irregular migration – a possible alternative in Ethiopia, told how they used the game “The path of life”, (created by the SCT Centre) through the theatralization of daily situations that the migrant must face during the irregular migration process. Following that, the operator Fabrizio Stasia told some episodes which happened during the project “I do not travel alone” in Crotone with MSNA, to make it clear the critical to work in a multicultural context and with minors. Afterwards it was Alberto Pagliarino’s turn: he read a significant passage of the Kafka youth novel America, which inspired the creation of a new project for the Centre. At the end of the morning, the lesson of Professor Alessandro Pontremoli, centered on the concept of the theatre that we deserve and the loss of quality of most of contemporary theatre. After the lunch break, the last two contributions were held, before the debate and the final restitution. 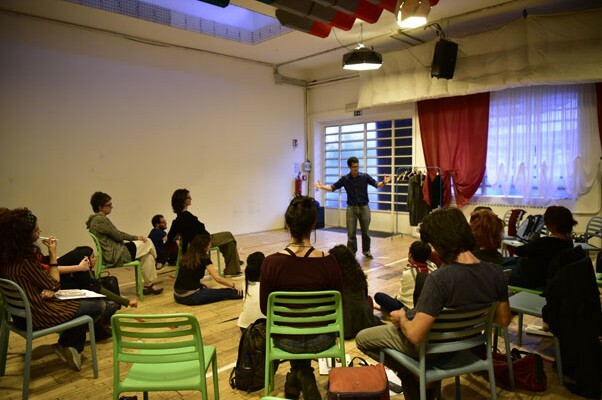 Director Ester Ruggiero, together with actress Federica Tripodi, presented the Sopra60 project, a social and community theatre workshop with a group of over 60 women, who led to the performance of the show on November 25 at Tetaro Astra of Turin. Finally, psychologist Silvia Cerrone, the organizational secretary of the Center, closed the two days with a brief intervention on the resources and fragilities that crosses the Social and Community Theatre operator.